Today I’ll be talking about the 1st game component that I’ve created when getting started, and also the backbone of the game: the cards. Always keep in mind that we’re very early development. That means that the design of the cards will 100% change, as well as the art (currently just using pictures from the internet) and most likely a lot of the mechanics will evolve as well. This was the building block for print 1.0 which got tested three times. The results were conclusive: People had fun enough and the game showed potential to grow. Doesn’t seem like much has changed, but for me these are huge steps forward. Let’s put them side by side for easier reference. The name of the card, “Minibot”, has changed to “Starter Minibot”. This reflects a few things. First, that we now have starter hands (with possible factions to come). Second, that I added simple keywords to stream-line the game creation process. Third, it also helps speed up the game set-up and clean-up process. That art is now custom-made. I commissioned an artist to improve on a sketch I did. At the moment he mostly works on mobile games concept art and draws Gundam for fun. A natural fit! However I asked Thach, our designer-in-training to re-color it white as if it had been 3D-printed, with a bit of blue and green glow to represent an important mechanic: the batteries. I actually really love this style and might hire the Hanoi artist for all art (if he’s up to it), to keep a sense of unity in the game. We might also color the Minibots in team colors matching the tokens or minis to make things more interesting to look at. Please let me know how you feel about that particular piece of card art. Feel free to re-design the Minibots if you want! 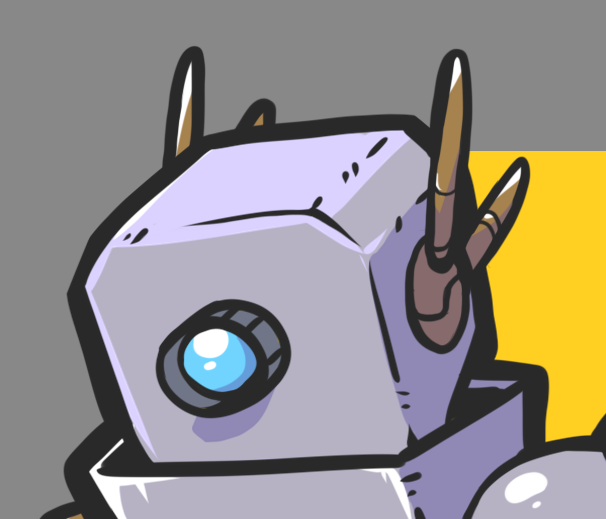 I’m interested in any type of Droid and Robot art. Under the art is the good old card type. My roots as a MtG player really show here. Some cards are meant to be used by – or with – specific compatible types, so this part is very important for now. Let me show you a pair of cards to prove my point. Here we have the basic Melee Weapon, and an Ability that can only be used with a Melee weapon. If you look to the right of card types, you’ll notice the MtG rarity square. Rarity doesn’t work the same as MtG in Minibots Arena, and for now it’s -again- mostly to help me keep things organized. Black (common) simply means there’s 3 copies of that card in the deck. Orange means it’s meant to be available in a starter hand. Let’s continue down the card and look at the creature abilities. Very simple for now but I’d like to make it even more intuitive. It’s a work in progress. This month I’ll start self-learning Illustrator to that effect. Ultimately I’d like everything to be represented by clear icons. The mechanics themselves have been placed in a specific order. Battery tokens usually let you activate mechanics and abilities. Basic actions like moving, attacking and working normally don’t need Battery tokens, however. Here’s one of my favorite cards, which has gone through a ton of change in terms of balancing. The idea behind it is that your Minibot’s running around with this thing in its hands and boots it up when it’s time to send it to gather loot. When your Minibot runs out of batteries, you can simply drop (discard) the item, or maybe hold on to it until you come across more Battery tokens (not that difficult with a bit of luck and clever deck-building). Speed Burst has been ridiculously popular in terms of times played and has gone mostly unchanged, besides wording. Sweet Wheels however has been re-named “training wheels” by Jesse while play-testing and I suspect it’s the reason why he never buys it (too macho). There are other Speed Bursts in the game but they are mostly a single-use deal. Sweet Wheels however gives you +1 constantly and comes back to your deck when it’s discarded. Notice that the Speed Burst card I’m showing you is part of the Starter Set. I wanted every player to be able to do something cool right on turn 1. If I implement factions, I might tweak this – one faction is faster, one is stronger, etc. That’s later however, for now I’m focused on play-testing the base mechanics. Melee Attack: Range 1 – Ranged Attack: Range 2 — I felt I needed to clarify this as most new players seem confused about ranged and different attack types. A great lesson for a game designer, as everything made perfect sense in my head! Melee weapons use the Minibot’s base strength and scale up, in an effort to make them more interesting to use. Charged Shot uses the Minibot’s Ranged attack as base. Thematically, it drains the bot’s battery to shoot harder rather than shooting from a possible equipped gun. Isn’t that miniature awesome? I believe it’s from Mechs vs Minions. +2 Work means that the Minibot equipped with that frame would receive 3 Pla for a single Work action. Since most Printer cards are below 4 Pla, this is a great way to build up your deck quickly. Inventory slots are losing a bit of importance but are still affecting the way the game is played in a big way and part of hand and equipment management. Basically, your Minibot can carry only one weapon or item at a time. That greatly limited Minibot customization in the past… an aspect of the game I wanted to expand on, so now there are “Upgrade” cards that don’t use any inventory slots, and ways to get extra Inventory slots… or take them away. A funny narrative that happened during the last playtest however involves 2 of the last 3 cards shared above. Jesse had a Minibot equipped with a Worker Frame and a Gun. I attacked it and Jesse used Sacrifice a Limb to keep it in play. However, what Jesse felt like he was stuck with then, was a sad Minibot with no other use than to walk around or work (technically, it could still make basic attacks or go back to its HQ in the hopes of getting upgrades). It could have also been used as a shield for another Minibot (but hexes make using cover difficult). At the bottom of the card is written Returns to your deck and is there because at the moment there are a total of three different decks in operation: Printer, Loot and Events. The Printer deck represents designs you would buy to improve your 3D-printed Minibot. They are bought with the currency (Pla, short for plastic, to emphasize recycled bots) and once purchased, stay in your deck for good – return to your deck after use. Loot cards are acquired by looting drop crates that “fall” in the arena during game play. They are generally different and more powerful than Printer cards but tend to have a Single Use only. These cards, when used or discarded, return to the Loot deck – you don’t get to keep them. (Yes, that’s art from the Gundam wiki and it’s perfect). I’ll need to add a clear icon to represent which deck cards go back to because I have to stay sharp during play-testing to make sure players return the cards to the right deck. The last part, the box with 1/2 is the same as MtG right now: first number is the attack, or damage value, and second number is the defense, or HP or life of the Minibot. Unlike MtG however, damage is permanent and stays from turn to turn. We’ve been using tokens to keep track of damage. A quick reminder that if you want to be up to date with the development of Minibots Arena, follow us here on WordPress, on Twitter or Instagram, or become an email follower (see the simple buttons below). Also, if you want to support this project, sharing to a friend is the best thing you can do at this time, and it is a huge motivator for me just to see I have a new follower, or that someone commented or shared. Thanks a lot for reading! I hope seeing something more tangible has made you hungry for more! Feel free to send me an email or comment below if you have any questions or requests for future devlogs!